• EmArc 75W - a new and exciting advancement in the world of light. A 75W compact package with precise and powerful light. • EmArc lighting technology equates to a critical blending of rare gas and metal additives to derive, in a single source, many of the key properties and benefits of standalone Xenon, Metal Halide and Mercury lamps. • Designed for use in medical, scientific, industrial and entertainment settings. 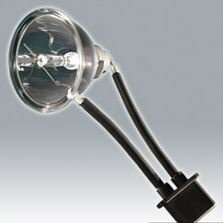 EmArc lamps offer advantages to an array of uses for imaging, fiber optic and other important optical applications. • EmArc lamps enable alignment in dichroic visible light or UV specific coated reflectors facilitating use in numerous applications like lighting for minimally invasive surgery, curing of light sensitive resins and adhesives and, dental whitening procedures. • EmArc enables its use in a number of entertainment applications including searchlights, follow spots, special effects and automated fixtures.